YETI: Abominable Snowman or Exoplanet Transit Survey? Authors: R. Neuhäuser et al. Caroline’s recent astrobite on EMU inspired me to pick a paper with another interesting acronym in the title. The Young Exoplanet Transit Initiative (YETI) is a ground-based survey to detect young transiting giant planets orbiting stars in open clusters. The collaboration conducts observations with a network of telescopes around the world (see the map below) so that they can monitor a field of view continuously during one- to two-week observing runs. The distribution of their telescopes around the Earth allows the YETI collaboration to detect planets with a wider range of orbital periods than would be possible if they used only a single telescope at a fixed longitude because they will not have as many gaps in phase coverage. (Some gaps, such as those due to bad weather, are impossible to eliminate completely.) The trade-off of gaining phase coverage is that the YETI collaboration will have to stitch together observations made with multiple telescopes and detectors under different atmospheric conditions. Why did the YETI collaboration decide to search for planets in young open clusters? The majority of exoplanets have been discovered around stars that are several billion years old. That means that the planets are also several Gyr old and may have migrated away from their original formation sites. If the YETI team can detect planets around young (1-100 Myr) stars, then those planets may still be in the process of forming and might not have traveled far from their birthsites. Detecting young exoplanets will allow astronomers to investigate how planets form and migrate during their early stages of existance. Several direct imaging campaigns have already announced the detection of young Jovian planets (e.g., HR8799bcde), but those planets are at large separations (10s or 100s of AU) from their host stars. Transit surveys like YETI are more sensitive to planets in short-period orbits, so YETI will be able to detect young Jovian planets that orbit much closer to their host stars than the planets detected via direct imaging. A 2.1 degree by 2.1 degree BVR color composite image of the Tr-37 cluster taken by the YETI collaboration on the STK at University Observatory Jena in July 2009. The white box is the 53 arcminute by 53 arcminute field of view that the YETI collaboration is monitoring. 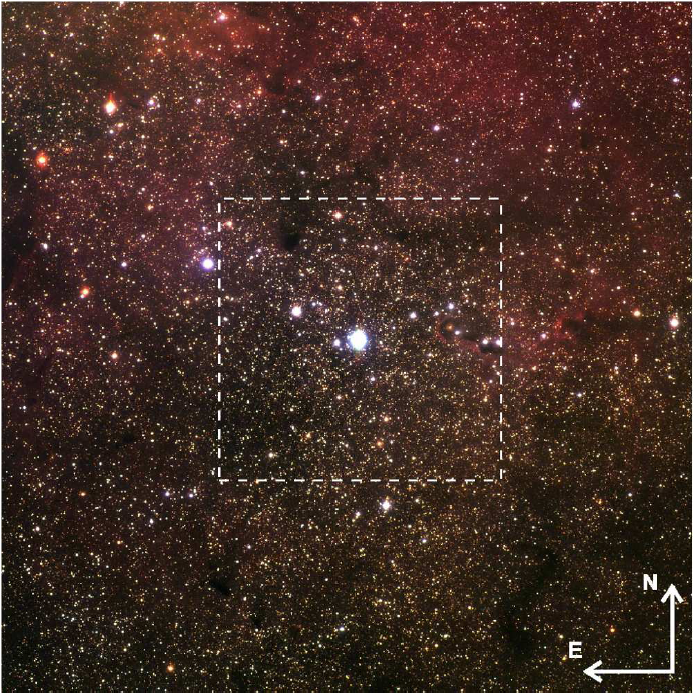 They observed this field in 2009 using only the Jena telescope and again in 2010 using the YETI telescope network. Figure 1 from Neuhauser et al. 2011. A second reason to look for planets in open clusters is that the age estimates for stars within a cluster are much more precise than the estimates for isolated field stars. Since all of the stars within a cluster were born at the same time, astronomers can use main-sequence fitting to determine the age of the cluster by comparing the colors and magnitudes of the stars in the cluster to expected evolutionary tracks in color-magnitude space. Astronomers can also use color-magnitude diagrams and color-color diagrams of the cluster stars to determine the amount of extinction along the line of sight and measure the distance to the cluster. Of course, not all of the stars within the field of view will be members of the cluster, but astronomers are able to determine the likelihood that any particular star is associated with the cluster by comparing its motion through space with the motion of the known cluster members. In the case of a young cluster, astronomers can also look for signs that a particular star’s age is consistent with the age of the cluster. For instance, Nehäuser et al. 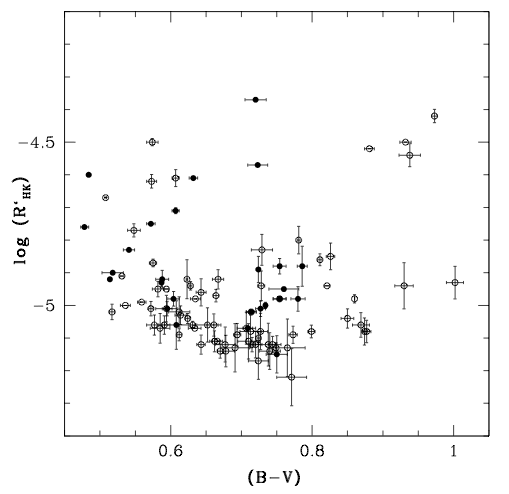 looked for stars with Hα emission, lithium absorption, X-ray emission, infrared excess emission (indicative of a disk surrounding the star), and positions in color-magnitude space in the pre-main sequence or zero-age main sequence regions of the Hertzsprung-Russell diagram. The YETI collaboration has already been observing the open clusters Tr-37 (pictured above) and 25 Ori for two years and will later observe several other open clusters to investigate the occurrence rate of transiting Jovian planets as a function of cluster age, metallicity, and density. Nehäuser et al. selected their list of target clusters by looking for clusters at intermediate distances (50-1000 pc) that are relatively young (1-100 Myr), have stars with magnitudes between 10 and 16.5, cover approximately 1 square degree of sky so that they are easy to observe with the YETI telescopes and CDDs, have not been the targets of other transit surveys, and have declinations that are appropriate for the YETI telescope network. 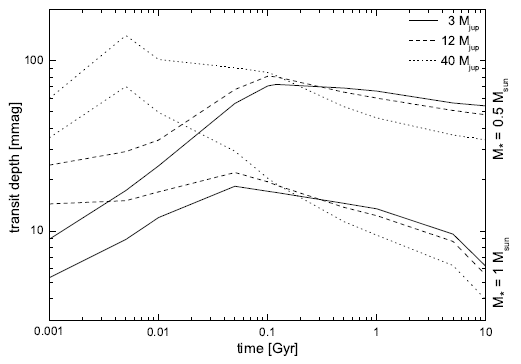 The specific stellar age range of 1-100 Myr was selected because young stars and young planets contract at different rates so that the ratio of planet radius to star radius (and therefore transit depth) is greatest during that time period. As shown in the figure below, the specific age at which the transit depth reaches a maximum depends on the masses of the star and planet involved in the transit. For a Jupiter mass planet orbiting a solar mass star, the maximum transit depth of approximately 15 millimagnitudes should occur when the system is roughly 50 Myr old. However, predictions of transit depth as a function of system age depend strongly on models of planetary structure as a function of planet age and those models are still uncertain. YETI is capable of detecting transits of stars with depths as small as 50 millimags for stars brighter than R=16.5 mag or transit depths as small as 5 mmag for stars brighter than 14.5 mag. 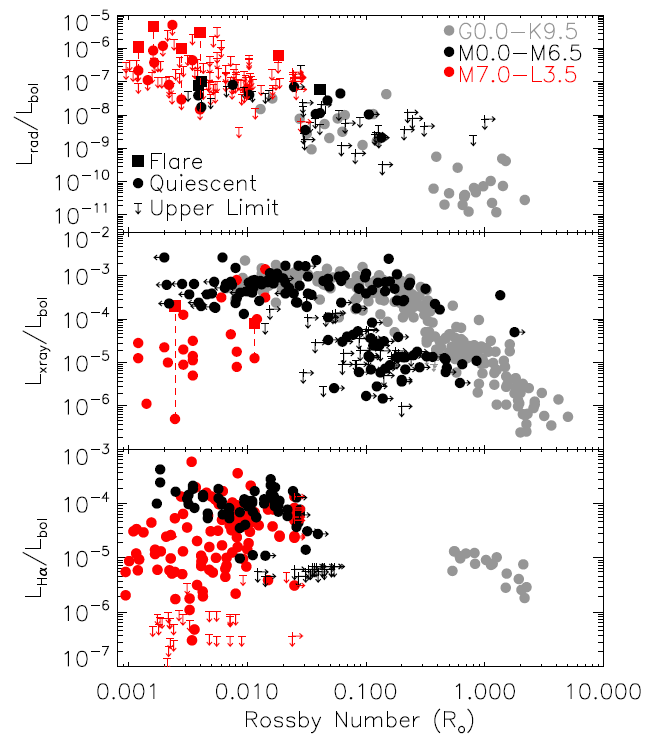 The expectected transit depth versus system age for a variety of star and companion masses. The top set of lines corresponds to planet or brown dwarf with the mass indicated in the legend transiting a 0.5 solar mass star. 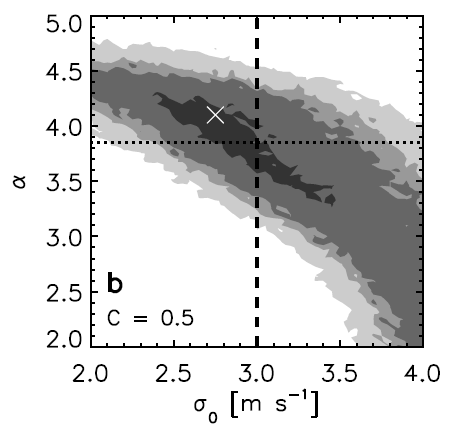 The bottom set of lines indicate the expected depth for transits of a solar mass star. Figure 2 from Neuhauser et al. 2011. Ideally, results from YETI and similar surveys will help astronomers better constrain the formation of young planets. Comparing the planets found within a particular cluster will allow them to untangle the joint effects of stellar mass, age, and metallicity on planet formation because they will have a set of planets detected around stars with the same age and metallicity. They will also be able to compare the YETI results with results from Kepler and other transit surveys to determine whether there are differences in the planet occurrence rate between stars in clusters and isolated field stars. Cross comparisons between the planets found in different clusters of the YETI survey might reveal trends in the planet occurrence rate as a function of metallicity or density and will allow astronomers to piece together a timeline of planet formation and migration at various stellar ages. The Radio Activity-Rotation Relation of Ultracool Dwarfs Super-Earths or Mini-Neptunes? Super-Earths or Mini-Neptunes: Part Two Are Stars with Planets More Active?